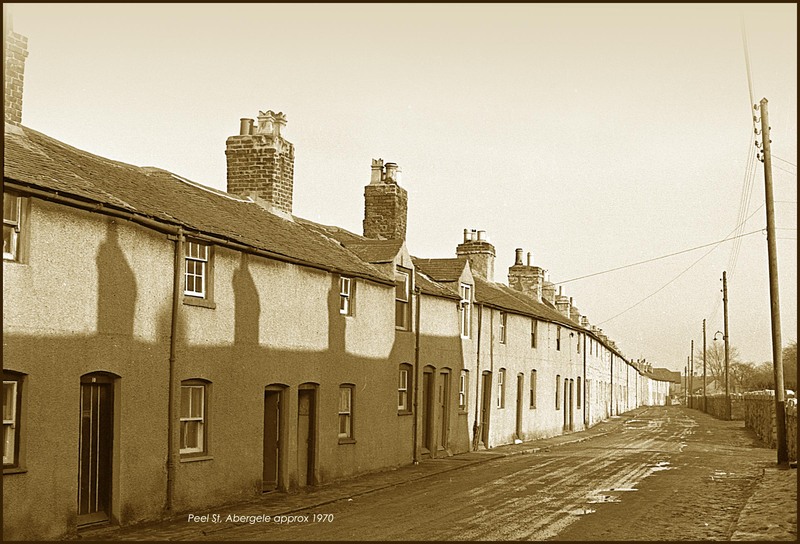 I was fascinated seeing the old photographs of Peel Street & which brought back many happy memories. I note that the comment on the photograph gives the date as ‘approximately 1970’ which I feel is incorrect. We used to live at No.25, more or less opposite the Telephone Exchange – you can see the driveway to the Exchange immediately prior to the second telephone pole on the right of the above photo. Several years ago, in an attempt to clarify which year we moved from Peel Street to the 1960’s built part of the Maes Canol estate, I had a look through the old Electoral Registers. In February 1962 my parents were registered in Peel Street, along with some 80 or so other voters. By the following February (1963) however, only those living at Peel Gardens, Glendalough & Casa Nueva (the two ‘new’ properties adjacent to the Telephone Exchange) remained. I seem to recall that once the last of the residents had moved out of the old stone terrace properties, they were pulled down very soon after. I don’t know if this is of any assistance to those who had wondered when Peel Street was demolished. On a related theme, do any of your readers know when the old Peel Street terraced properties were originally built? The 1830 O.S. map (Unions, Denbigh) & the 1840 O.S. map (First Series, 79 NW – Denbigh) both show several properties towards the Water Street end of the street but they don’t extend all the way as far as Peel Gardens. Perhaps someone can shed further light on the matter. Your are quite correct in your assumption that this photo was taken during the 1960’s ! When I posted this photo I presumably guessed at the date. However I have now checked my records for some evidence as to when I took the photograph and on the same strip of negatives is a photo of our car near pen-yr-efail crossroads in deep snow. This was definately in the 1960’s during that very hard winter most likely 1963. Hope that this makes things a litte more clear ! My great aunt Margaret Davies born 1885 went to Patagonia in the early 1900s, no married name sadly lived in peel Street, anybody know her living family ? Interesting to hear of this Patagonia/Abergele link Val. Good luck with your research. Val – would be intrigued to hear any more details. During my research into the Great War period I have encountered a handful of cross-references with Patagonia. A group of very young people (I note that your Great-Aunt would have fitted that description) appear to have gone together, or within a short period of time, some ten years or so before 1914. Interestingly, it appears that many did not stay too long. I have a reference somewhere to the fact that they soon became dismayed by non-British rule, and many of them moved on to Western Australia in the few years prior to 1914. Some of the young men ended up serving with the Australian Army in WWI. Daniel Davies (28), Head, Farm Labourer (Em’ee); Emma Davies (26), Wife; Magie (sic) Davies, 5, Daughter, Scholar; Grace Davies (3), Daughter & Hannah Davies (2m), Daughter. All are shown as born Abergele, Denbighshire apart from Emma who was born St. George, Denbighshire. The ’em’ee’ shown with Daniel’s occupation merely classifies him as an employee as opposed to an employer. The 1901 Census shows a Daniel Davies (born Abergele, 1863) as the head of the household residing in the Civil Parish of Rhyl. A separate search shows a 15 year old Margaret Davies (born 1886) employed as a servant & also living in the Civil Parish of Rhyl. I’ve not looked at either of those entries in detail but they may give you a starting point for your researches into what became of them all. A search for ‘Shipping Lists + immigrants to Patagonia’ also throws up some interesting links on the subject. Hope that’s of some use to you. Thanks for the detailed reply. Yes this is my family and I do have these details and have made great inroads into finding there marriage and there children and while digging for Margaret all the time have met some lovely people. I have just found Margaret’s sister Grace inlaws relations and that was so interesting and shocking as Graces husband was killed in WW1 so well documented. All this information while looking for a Margaret but still she evades me. Thank you so much for taking the time. I wish I had been notified by e mail I would have thanked you long ago. Once again just seen Andrews reply, I was searching for Margaret again and by googling, Andrews reply came up. Thanks you Andrew I will reply although short of DNA or a love letter to Jane from Frank I’m guessing I will never trace him. See how cynical this FH has made me lol. Is there a way I can receive notification from this site via e mail or is the only option to visit here every day? Valerie, to assist you in keeping up to date with what’s happening here you could subscribe (free) to our mailing list. Just below the ‘search’ option, at the top right of the page, you will see another box. All you need do is enter your e-mail address to receive a regular update mailing. Hope that helps for the future and good luck with your research. I know from personal experience just how frustrating it can often be trying to trace an elusive relative. I’ve just recently read this. I lived in 2 Kimnel Cottages, our family left when our house was planned to be demolished. We moved to Maes y Dre. I can remember as a kid we played in the ‘numbers’ at the bottom of kimnel cottages, climbing trees and making dens. Our playground was the whole street, as there were never any cars, no one owned a car. I grew up playing bowls across the road with my dad. I rang the bells on a Sunday at St Michaels Church. Great post about great memories Roger. Many thanks to you.